Polished brass accent sign for apartments, offices, condos, boats, and hotels. 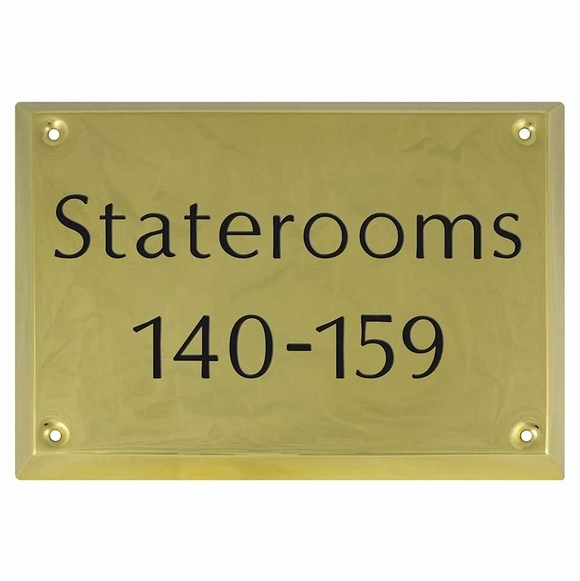 Just the right size to hang near a stairway, elevator, or corridor to help guests and customers find a numbered stateroom, hotel room, apartment, cottage, medical office, classroom, or other numbered destination. Can also be used as an address plaque, house name plaque, or office door sign. Custom made with one, two, or three lines of wording you supply. All three lines can hold up to ten (10) characters each. If you are ordering a one-line or two-line sign, please leave the extra input boxes empty. Four engraving styles: clarendon, old english, optima, script. Small image shows a sample of each style. Color: brass with black wording. Special order. Please allow 3 to 4 weeks for delivery. Comfort House P2703.